The Netgear EVA9150 media server, otherwise known as the 'Digital Entertainer Elite', is one of a rash of devices for playing media stashed away on a computer or network hard drive. 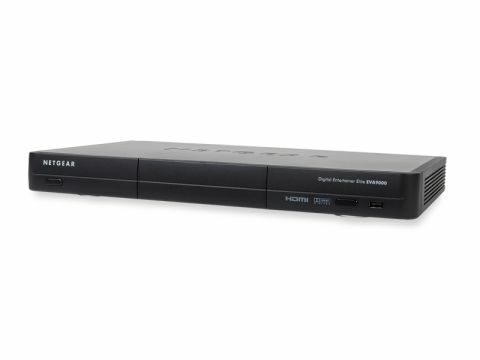 This can be streamed via Ethernet, wirelessly or directly accessed from the included 3.5in 500GB hard disc, easily swappable using a neat front-mounted caddy system. Alternatively, flash or hard drives can be inserted via USB for file transfer/playback. Added to this are a comprehensive selection of AV outputs (HDMI, component, Scart and composite are included). Physically, it's quite a beast – slightly bigger and heavier than a Sky+ HD receiver. The gun-metal grey casing has a 'pro' rackmount feel about it with no display or LEDs to speak of and, impressively, it doesn't run hot after hours of use. The remote is well designed and sensibly positioned and labelled buttons cover most operations. The setup wizard makes installation easy. The Elite can detect nearby wireless connections and you can use your router's 'push and connect' protected setup button (WPS) if it has one. The Elite works with UPnP-compatible devices, including PCs running Windows Media Connect. Accompanying installation software for your PC gives the option of choosing which folders to share with the router. The menus are well designed, employing large text and being logically arranged. You can browse for media by folder and video files by genre, actor, rating, year, decade, and file type. Music can be viewed by artist, album, album art, genre, file type, year and decade. Web-enhanced functionality comes with the ability to stream videos (including HD) from YouTube with a favourites option, listen to internet radio stations, view photos on Flickr and browse web content from sites such as Yahoo with support for RSS feeds. The Elite will also act as a BitTorrent client for P2P downloads. File formats supported include DivX and XviD as well as DVD image (ISO) and MKV files and there's effective 1080p upscaling for standard-def video. AV performance is excellent; the Elite had no problem buffering and playing back DivX, Xvid and 720p MP4 camcorder files relayed wirelessly via our Wireless N router. Even 1080p playback was smooth. The Elite is pricey and lacks some of the features found on rival devices (like TV tuners), but it's easy to use, with decent overall performance.